The prospect of dry rock and warm weather saw five of the clubs climbing contingent converging on Roybridge campsite on Friday evening. A Campbell/Ferryesque email conversation earlier between Chris & Alison finally decided on Centurion on Ben Nevis as Saturdays destination after Chris’s initial offer of The Bullroar was discounted (later described as harrowing by parties on it!). Although it was warm on the walk in our latest SMC member stormed on past the tempting facilities of the CIC hut and we were soon at the bottom of Carn Dearg buttress gearing up for the route. 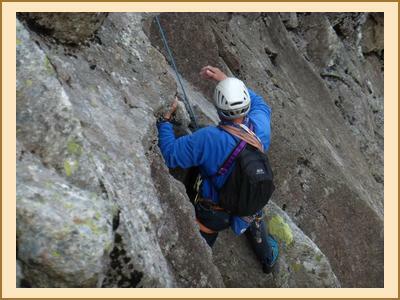 Centurion is a classic 4 starred route from the legendary Don Whillans. I climbed with Fiona whilst Alison, Kenny and Chris made up our other team. From Hardrock - Pitch2 – “One would be ill advised to venture onto it after a long layoff” – Chris’s 2nd lead of the year! Pitch6 – Despite watching several folk climb this and the guide book clearly stating the way Fiona managed some absolutely desperate looking moves straight up to reach the belay(we all stepped left and then back right). A wintry descent of no 5 gully brought us back to our packs and the walk out with Kenny commenting on how we took longer than it took them to do Zero Gully in the winter due to traffic on the route. On Sunday the weather was again superb. Chris did a big circuit from Loch Arkaig taking in the munros Sgurr Mor and Gairich via the Corbett Sgurr an Fhurain. His 9 hour jaunt had fantastic hot weather. 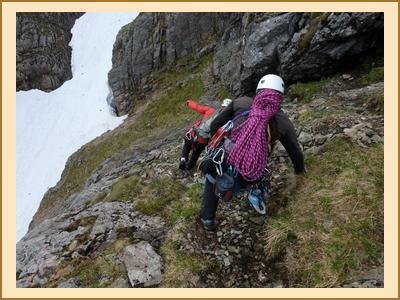 Alison, Kenny, Fiona & I opted for some more climbing on Aonach Dubh. A venue that was new for us. Fiona & I opted for Curving Crack whilst Kenny & Alison took a look at Weeping Wall Route. Both had some good climbing. The dreaded midge were starting to make their appearance but it was still an excellent weekend with good company (thanks to the A&K 5* tent) and excellent weather.